Affixes are building blocks of language. 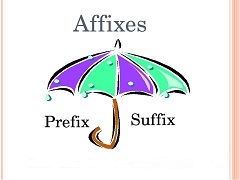 The four types are prefixes, suffixes, combining forms, and infixes. We are familiar with prefixes, which placed at the beginning of words qualify their meaning (inappropriate) and suffixes, which convert the stem into another part of speech (celebrate to celebration). Combining forms, which can be either prefixes or suffixes, add another layer of meaning to words (biochemistry; pesticide). The least common affixes are infixes, which are placed within a word (in this case, to form the plural cupsful).